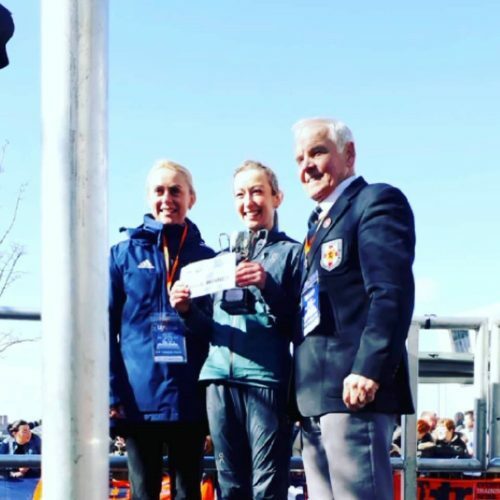 Kirsty Longley continued her recent good run of form by winning the Liverpool half marathon on 25th March, she completed the course in 76.29 which would have been an impressive pb at this distance. However due to the course being measured about 400m short along with many other athletes who ran well on the day she was disappointed that months of preparation was not rewarded with a pb. This is Kirtsy’s second half marathon of the year having won the Thorpe half in London in February. Hopefully the organiser will compensate all this years runners with a free entry into a correct distance half next year. Kirsty’s recent good performance have rightly earned her an England call up and she will be wearing her England vest at the Great Birmingham 10k in May. Her good for age times in recent road races will her win a road vest to go with the cross country vest she won last year. well done Kirsty. ← Winning start for Hope.